Amazon employees in the US are testing a physical grocery store format that will use technology developed for self-driving cars to allow consumers with a dedicated mobile app to walk in, pick up the items they want and leave without going through a traditional checkout. 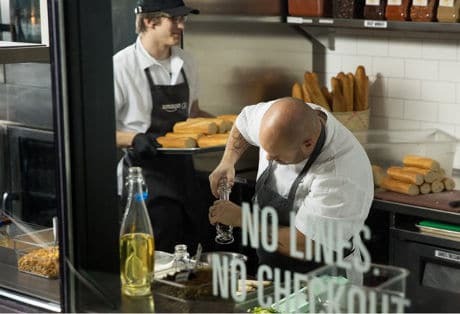 Customers enter the Amazon Go store by scanning the barcode generated by the app on their smartphone. Amazon’s Just Walk Out system then detects when products are taken from or returned to the shelves, and keeps track of them in a virtual cart. When the customer leaves the store, payment is automatically deducted from their Amazon accounts and a receipt is sent to them. “Four years ago we asked ourselves: what if we could create a shopping experience with no lines and no checkout? Could we push the boundaries of computer vision and machine learning to create a store where customers could simply take what they want and go? Our answer to those questions is Amazon Go and Just Walk Out Shopping,” Amazon says. The “conveniently compact” store has an area of about 1,800 square feet and will offer a range of everyday groceries, artisan items and ready-made meals. Amazon Go is currently in beta testing for Amazon employees and “will open to the public in early 2017”. It is the latest move in Amazon’s programme to revolutionise retail. Last month, Amazon added more than 60 brands to its Amazon Dash Button program that allows consumers to reorder consumables around their home with a press of a button.